Happy Halloween! This past weekend my mom celebrated her birthday with a Halloween themed birthday party. We decided to go as matching mother/daughter egyptians haha. Here's a costume I put together from Party City. 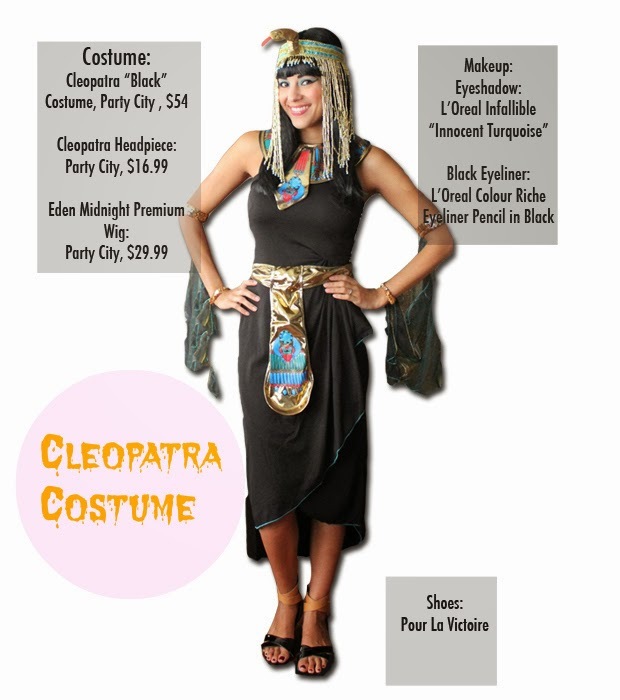 The costume is called "Cleopatra Black" and I added a few other accessories like this Cleopatra headpiece for only $16.99 and the 'Eden Midnight Premium Wig.' To finish off the look, I added a pair of gladiator sandals I had in my wardrobe (these are from Pour La Victoire), but any gladiator sandals would work for this look. For the makeup, I got inspired by Elizabeth Taylor in the movie Cleopatra and used blue eyeshadow (I used the L'Oreal Paris Infallible "Innocent Turqouise") all over my eyelids. Then with a black eyeliner, I created the egyptian look and filled in my eyebrows. I also added fake eyelashes. I used the Ardell "Bat Those Lashes" which already came with a sample eyelash adhesive at CVS (otherwise some of them don't include that actual glue). What will you be dressing up this Halloween? Hope you have a safe Halloween!